November 6th was finally here! Alonzo was set to be home for a few weeks without having to travel. October had been a long month of traveling for him and for me I just wanted him to be home just in case I went into labor a bit early. The week prior I felt like I wasn’t even pregnant. I felt great. Everyday I was out and about or cleaning the house. I wasn’t sure if this was the “nesting” phase everyone talked about but I was just happy to be feeling good again. I was really looking forward to my 38 week appointment but I woke up feeling some cramping. With every cramp I was stopping in my tracks to take a breath. This had been happening on and off throughout the night. I had felt cramps before but usually after I got up and walked around a bit I felt better. This wasn’t going away. In the car before my appointment I recorded a video. I explained I wasn’t feeling right and I felt like maybe today or some time very soon Lonnie would be coming. Alonzo and I got to the hospital and I checked in with the receptionist. The receptionist told me my midwife called out and I would be seeing someone else. During my entire pregnancy I had seen the same midwife so I was a bit disappointed but I went with it. The nurse took us back and began to check my blood pressure. 148/98, then 138/88, then 136/88. My blood pressure prior to pregnancy was consistently 120/80 so this immediately alarmed me. When the midwife came in we talked a bit and she said just to be sure she wanted to send us up to triage in labor and delivery to have them monitor my blood pressure. Alonzo and I were just thinking this was routine and at this point we were still planning on going to lunch after all this. After about 30-45 minutes, an OB walked in and said, “Well we’ve been monitoring you and your blood pressure isn’t going down. My recommendation is that we induce you and you will not be leaving this hospital without a baby.” Excuse me, what?! I think Alonzo and I just froze. We were there for a routine appointment and now you’re telling us we’re not leaving this hospital without a baby?! So after about a minute I snapped out of the initial shock and said “okay… what is the plan?” Immediately I knew my plan, call my mom. A midwife came into our room and starting the process of admitting me. Alonzo and I were still kind of confused as to why this had to happen today. She explained exactly how my induction would work and exactly why I was being induced today. I was being induced because I had gestational hypertension and the only way to cure it was to deliver the baby. The plan was to use a foley catheter and pitocin. The midwife told me it could take up to 3 days to have our baby. This made a lot more sense to us and I could tell Alonzo was now on the same page and on board with everything. I was settled in my labor and delivery room. To start the induction process they inserted a foley balloon catheter to help my cervix dilate. When the midwife explained that they would inject saline into what looked like two balloons my eyes almost popped out of my head. I wasn’t a fan of this method but I just wanted to have Lonnie as soon as possible so that both of us would be in good health. My contractions started off at about 10 minutes apart. By the time my mom arrived at 5:00 p.m. they were about 5 minutes apart and I was in a lot of pain. They were lasting up to 90 seconds so I had less than 3 minutes to recover from each one. Around 9:00 p.m. they were consecutive and I was close to crying. I had Alonzo go get the nurse so that she could check to see if it was time for the foley balloon catheter to come out. It was supposed to come out once I was about 4 centimeters so I was praying I was close. The nurse came in and didn’t waste any time. She pulled it and it felt like two NBA size basketballs popped inside of me. I let out the loudest scream and scared both my mom and Alonzo (although he will never admit it). I had never in my entire life felt pain like that. The nurse said “now that part is over and you can get some rest!” She was right. I took a shower, I could talk to my mom and Alonzo again and I felt so much better. I was at 4 centimeters and they started me on pitocin. At this point my contractions weren’t as painful but after experiencing the contractions from the foley balloon catheter I was sure my plans of a natural birth were out the window. The next few times I woke up it from the contractions. They were so strong and intense! I remember a midwife and a few nurses rushing in and saying that my blood pressure and heart rate were so high that I was putting the baby and myself in distress. At this point they highly recommended an epidural. I was so out of it I just said okay and I have little to no memory of the process. It felt like I had been sleep an entire day. I woke up to a nurse saying that I was probably pretty close to having the baby. She went to get the midwife to check me and she was right! 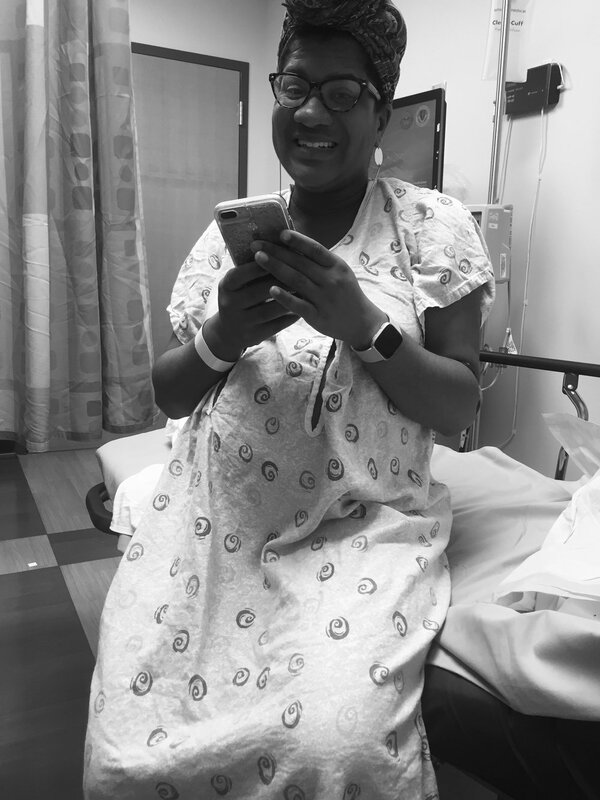 I was 10 centimeters and ready to start “practice pushes.” All of sudden there were about 10 more people in the room and the room was being prepped for the arrival of our baby. With this being my first child I really had no idea what I was doing when it came to pushing. I was also still pretty loopy from all the drugs. I pushed for about 30 minutes. I was so anxious and overwhelmed that I was losing my breath. Alonzo kept telling me, “catch your breath, you got this, breathe.” I was refusing to take the oxygen and just not focusing on my breathing to realize I needed it. Somehow I snapped out of it, pushed 4 good times, and he was here! Alonzo McNeal III was born. I thought I would cry hysterically like I had after watching endless birth stories on YouTube. I didn’t though. I sat there calmly and watched the joy and love on Alonzo’s face. My mom was by his side crying and hugging him. It was just a beautiful moment. Giving birth to a child is the most beautiful experience. You go through so many incredibly different emotions to find that they are completely erased once you see your child’s precious face. “You will never know love like the love you have for your child,” is what my mom always told me. Mom you were right. I created a YouTube video of our journey to my delivery date. Check it out, HERE! Older PostMAMA MARZ | 3RD TRIMESTER, WHO DIS?